Zantrex-3 Review (UPDATED 2019): Can Their Claims Be Trusted? Zantrex-3 Review: Can Their Claims Be Trusted? Known for being promoted by MTV’s Jersey Shore star Snooki, Zantrex-3 uses its celebrity endorsers to bring in it’s customers. Zantrex-3 claims to be a miracle weight loss pill that allows users to lose weight without having to diet or exercise. But is this real? Or like TV and movies, is it just a fantasy created by the collective mind of those who want to see results without having to put any effort into it? We did some research and here’s what we got from it. Zantrex-3 is manufactured by a Utah based company known as Zoller Labratories. 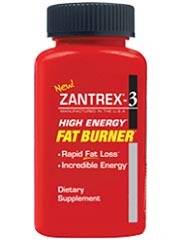 Zoller Laboratories also produces other weight loss products, such as Zantrex Black, Zantrex Black-3 Fat Burner and SkinnyStix. Zantrex-3 can be found in stores such as Walgreens and CVS, as well as online from retailers like Amazon. It is directed that when using Zantrex-3, to take two pills before the days main meals, along with a full glass of water. The company instructs people to take no more than 6 pills a day. It is through a consistence in this routine that Zantrex-3 claims to be able to get people to lose weight, even without proper diet and exercise. Despite these claims, many users have had less than star struck results. Yerba Mate Extract: Contains compounds that act as an appetite suppressant, while at the same time increasing mental energy. Guarna Seeds: Popularly used to extract caffeine. Can be found in energy drinks. Trimethylxanthine: Contains high amounts of caffeine to give the user an energy boost. Damiana: Has been shown to have a thermogenic effect; raising the body’s temperature thereby in theory also the metabolic rate. Kola Seeds: Originating from Africa, this ingredient contains caffeine. Schizonepeta: Used in Asia for maladies such as fever, sore throat and colds, there is no research showing that this ingredient can help with weight loss. Zantrex-3 also contains Black Pepper Extract, Rhodiola crenulata Extract, Asian Ginseng Extract, Maca Extract, Cacao Extract, Black Tea Extract, none of which have shown to have any effect in weight loss. Side effects: Heart palpitations, irritability, insomnia, nausea, headaches and muscle tremors. Products from Zolar Laboratories can be returned within 30 days with a 100% money-back guarantee. While claiming to help a lot, the ingredients listed in Zantrex-3 include a lot of caffeine. Using a lot of caffeine based ingredients isn’t something that is uncommon to weight loss supplements. The theory with Zantrex-3 is that the caffeine can help give the user an energy boost which can help them get more active. While good in theory, having a lot of caffeine doesn’t necessarily help you lose weight, in the same way that drinking a lot of coffee won’t help you lose weight. And that’s not to mention the negative side effects that can come from Zantrex-3. According to the company’s website, Zantrex-3 has 546% more weight loss than the normal ephedra based pill. 546%? Such a high number, and exactly 546%? The company’s website have a compare and contrast with Zantrex-3 and an unnamed best seller product, but there isn’t any scientific sourcing for any of this. To add to this, even on the compare and contrast page, they make sure to include a part saying that the FDA has not verified these claims. It’s like the saying goes, incredible claims need incredible evidence, and as it shows on the company’s own website, they don’t have the evidence at all. While claiming to do a lot, much of what make up of Zantrex-3 is caffeine. To add to this is that it tries to be thermogenic, but that’s still not very valid. Unable to be backed by any scientific validity, the effectiveness of this product is extremely questionable. No matter what Zantrex-3 would like it’s potential buyers to believe, the claims it makes about it’s product have no validity. All Zantrex-3 has, is a lot of caffeine that that masks the fact that the product may not even work at all. If this disappoints you don’t worry, as there are plenty of products out there for the same or even a cheaper price that are actually effective. If you don’t feel like being jittery and irritable after throwing down $40 for a weight loss product that might be closer to a placebo than the real deal, it’s best that you spend your money elsewhere.